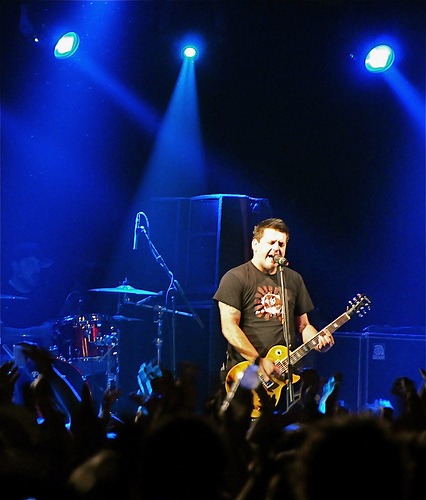 Less Than Jake is headlining Movin’ On, if you haven’t heard. I’ve seen them a couple of times live, and they’re a pretty decent live show. Though I don’t like their new stuff nearly as much as their old stuff (newer is much more punk than ska, in my opinion), I believe they will still put on a great show. Mayday Parade (if you ask the Collegian, “May Day Parade”) is also a good live act. Derek really knows how to belt, and I may or may not have a big crush on him. I am really unsure of their newest CD, though. It seems to me that it was just written for the sake of being written, which is never a good sign. I had never heard James Kinney before he was announced, but he’s got a pretty cool soul sound, like a more rock-oriented John Legend. Should be a nice change-up from all the pop punk. I’ve already discussed The Dangerous Summer, and I hope they will be solid. For the budget given, I’d say they did a pretty solid job. Who doesn’t like a good ska band? I hope the skanking is out of control. What do you guys think of the line-up? Melanie is a senior majoring in both Marketing and Advertising. She enjoys blowing bubbles, beating boys in Mario Kart, and going to concerts. Oh, and she takes photographs, as well. Leaving Penn State was tough. I made so many memories in Happy Valley that it was a difficult transition to go through. Though I lived up all four years I spent at PSU, I can’t help but occasionally think, “Why did I ever leave?” I thought I’d reflect on my current life and college life and give some advice to those of you who still have time at PSU.